Recently, on the day after Thanksgiving, I did a make-up class for a student, Le Le. Our classroom was freezing due to a lack of heat, as our building in Korea-Town on West 32nd Street was deserted. I went to a local store to grab a small heater. When Le Le walked in, I asked him not to take off his coat, and then both of us studied Chinese for a good hour with our coats on. Le Le’s mother, Wen, is a native Mandarin speaker and a first generation immigrant like myself. His father is an American who doesn’t speak Mandarin, just like my husband. From his mother and a Mandarin-speaking nanny, Le Le has learned to speak some Mandarin. He came to study with us as a bubbly 3 year old, and stopped at age 6. Six years after he left our program, at age 12, he joined our 2018 Silk Road trip. We peddled bicycles to circle the great ancient city walls of Xi’An. We rode on the same desert vehicle charging across the Gobi desert near Dunhuang. We wandered through the ruins of the ancient Turpan Kingdom. In China, there is a mountain named Mt. Tian Shan. On the mountain there are many flowers, grass, and trees. They are very beautiful. We both smiled and moved on to the next Chinese sentence. Fleeting through our minds were the winding roads, the deep green foliage, and the velvet blue lake water. We went to Mt. Tian Shan on our last stop of the Silk Road trip at Urumuqi. Right after the Silk Road trip in early July, Le Le told his mom Wen that he wanted to reassume his formal Chinese studies. Both Wen and I were pleasantly surprised, but we both agreed that we should wait till the beginning of the Fall semester to see how Le Le felt then. Fall rolls around. In early September, Le Le was still interested. So, he enrolled as a regular student into our program, thus, the classes and a make-up class with me on this cold Black Friday. A week before Black Friday, Le Le advanced to Level 3. In the same make-up session, I got him to review some of the Level 2 reading characters. Le Le stumbled on the character 皮. I told him it’s pronounced as pi. He immediately shouted — 羊皮筏子 (yáng pí fá zi). Yangpifazi is translated as “sheep-skin raft.” We rode on one to cross the Yellow River near Lanzhou City at the supposedly exact spot where Xuanzang, the great Tang dynasty monk, crossed the river on his journey to the West. But for Le le, it is different. The two instances of Mt. Tian Shan and the sheep-skin raft have shown me that he has gotten a small but tasteful bite of the culture. This has enabled him to situate the language into a richer context at an early stage of his formal Chinese study. I was really touched by Le Le, as I have been by many students throughout the years. Their minds work in magical ways that we can only understand by witnessing how they work in different contexts. As I was sending Le Le on his way after the class, he ran into Martin. Martin is a high school senior studying at a boarding school in Connecticut. He grew up in Shanghai and was on the supporting staff team for the Silk Road trip. Le Le and Martin exchanged a quick “ni hao” before I sat down to work with Martin on his college applications. Within our program space, the “Silk Road Members” bump into each other here and there when they come to classes. Underneath their seemingly “nothing unusual” interactions, there are the collective memories of the ship-skin raft, the camels, the Gobi desert, and the ancient Turpan Kingdom. On June 25th of 2018, members of our gravel group arrived from all directions, near and far, to convene at a hotel in Xi’An, China. Pang-Mei arrived from Singapore where she had visited her parents. Another mom, Bohua and her son, Tiger, arrived from Nanjing where they had visited Bohua’s parents. Also arriving were Wen and her son Le Le who had a brief stop in Beijing after a few days of travel in Switzerland. I was arriving from Chengu (where I taught a college-level Child and Adolescence Psychology class to educators from all over China) with two other parents and their children, while another parent, Ana, arrived with her son Logan on the same route but on a different train. Logan had just completed a volunteer job at a panda center in Chengdu. The Hulstrom family arrived two days earlier to explore Xi’An for a bit on their own. One of our staff, Shiyu, arrived two days earlier with her mother Haiyun. Shiyu teamed with me to co-lead the group. She is a graduate of Chicago Art Institute; a talented art educator as well as a fun and caring person. The hotel is very nice. The gym is located on the 4th floor. Laundry on the 8th floor. Breakfast is served from 6:30am to 10am. Afternoon tea is served 2:30pm to 6pm. Both are included in the room fee. The lobby has fruits and mini bar. All the amenities in the room are free, including the mini bar, snacks, mini fridge and hot water kettle. Please fee free to reach out if you have any questions. Can’t wait to meet all of you later! This hotel is my favorite in Xi’An, after having stayed at different hotels by myself or with our CCBG families from pervious years. The hotel is situated on a quiet street, but is also only a few minutes’ walk to the city center and to the ancient walls of Xi’An. On the first night together, our members were already hitting the famous night markets around town and to the ancient walls. Each day was packed with activities during the daytime and by night members did their own things in units of family or families. Xi’An was the capital for ten Chinese dynasties. As the capital for the Han and Tang dynasties when the Silk Road took shape and flourished, Xi’An sat on the eastern end of the Silk Road. It was where merchants, diplomats and monks from the East and the West met. For those whose homeland was from the far West, Xi’An was the end of their long journey. They would unload their goods and sold them at the Xishi 西市 (western) Market. For the merchants who were Chinese natives, Xi’An marked the beginning of their journey where they sampled and selected their goods from the Dongshi 东市 (eastern) Market. Our daytime activities unfolded in an order that allowed members to understand the connections and transitions of three major early Chinese dynasties — Qin, Han and Tang. We contrasted the all-mighty Terracotta soldiers in the tomb of the first emperor of Qin with the modestly sized wooden human figures of the early emperors of Han. We captured the transition from the Qin to the Han by highlighting the dramatic event of the Hongmen Banquet (鸿门宴). In this historical banquet, two generals Xiang Yu (the stronger general, younger in age and larger in body and army size) and Liu Bang (the weaker general), rising up against the last Qin emperor, met for a “banquet” where Xiang Yu hesitated about killing Liu Bang against the advice of his advisor Fan Zeng. In between our two lunch tables during our lunch break inside a restaurant, and before we boarded the bus to the Hongmen banquet site, the children put up a play to act out the highly dramatic but subtle banquet event, with eight characters in total. Sitting at their tables, teachers and parents watched Liu Bang, Xiang Yu, their advisors and generals maneuvered in a delicate sitting with sword dances, failed secret signals, and the eventual escape of Liu Bang with the excuse of going to the bathroom. In history, Liu Bang escaped his would-be murder and waged a four-year long war against Xiang Yu. Xiang Yu was eventually defeated by Liu Bang and killed himself, while Liu Bang became the first emperor of Han. No Chinese person I know had ever asked this question, or even thought of this question. But it is a valid question and a great one. Chinese folks love drama and believe that little things shape the big things. Therefore, without the bathroom run, Liu Bang very likely would’ve been killed; then there would not have been the Han dynasty, as we know it, Han culture and influences, or even the Silk Road. Night bike ride on the wall. The second night in Xi’An, some of us went to ride a bicycle around the ancient Xi’An walls — the largest intact ancient city wall built in the Qin dynasty and repaired during the Ming dynasty. The walls form a square shape separating the ancient inner city from the outer city. Walking on top the walls is like walking down a very long street as wide as Fifth Avenue in Manhattan. There are options to circle the full length or a part of the walls (approximately 14 kilometers or 8.7 miles): on foot, by bicycle, or being driven on a trolley. The four teenage members of our group who so happened to be hanging out with me that night wanted to ride their own bicycles and circle the full length. The bike ride typically takes about 2 hours. There had to be an adult to ride with them for supervision so I cautiously joined them. From a previous trip, I learned that at night, walking or riding on the walls was tricky. You cannot stop midway and should go all the way once you’ve started because the exits along the way that are otherwise open during the day are mostly closed at night. It was getting darker. I gathered all four teenage members before we set off to go through all the rules item by item. The most important one was to stay within my sight and with the group at all times. This meant that the ones who were strong riders should not ride faster than the weaker riders; those who were weaker riders would need to strive to finish the ride even if they were tired. One of them told me that he had not ridden a bike in eight years, but he really wanted to go. With rules set and promises made, the five of us were off! We finished the entire ride around the wall in 1.5 hours instead of the typical 2 hours. After a goodnight’s sleep, we were ready for our next stop. Overlooking the Yellow River from the Zhongshan Bridge of Lanzhou. Along the ancient Silk Road, the travelers would leave the grand capital city of Xi’An, inching westward, and eventually meet the Yellow River. There was no other way but to cross this mighty river. (The first real bridge that crosses the Yellow River appeared more than 1,000 years later in 1903.) So, the ancient travelers selected a spot where the river was relatively narrow to make the trip across the river. Also crossing the Yellow River at this spot was Xuanzang, the great Tang monk whose footsteps we were following. We arrived at Lanzhou by train from Xi’An. The train ride only took 2.5 hours on the modern high-speed train, but it would have taken weeks for Xuanzang. Besides, he had to sneak out of the Tang capital because the emperor of the newly founded Tang dynasty forbid his citizens to go out of the country freely due for the potential “instabilities” this would supposedly cause his country. Whenever I could find local friends to guide us in a city, I solicited their help instead of that of guides from a travel agency, who often spill out long passages of recited information. Locals bring to us their unparalleled knowledge and genuine passion for their land. Here in Lanzhou, a local friend, Zou Yong, guided us. 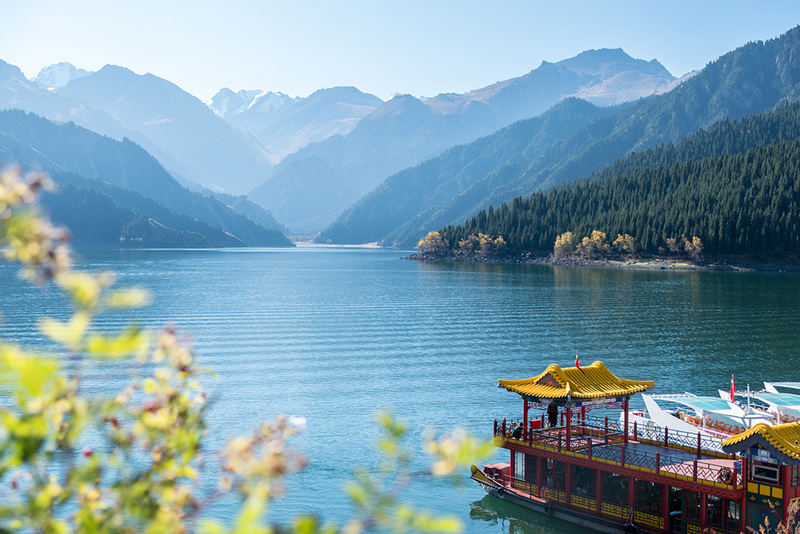 Zou Yong is an expert in travel of the northwestern parts of China. He holds the speed record of crossing some big deserts in Xinjiang. In preparation for this Silk Road trip, I had a test run with Mr. Zou a few months earlier in Lanzhou and we mapped out the itinerary for the day through many subsequent long-distance discussions. We walked across the first bridge ever built over the Yellow River. Like the locals, we rode on our bus and crossed the Yellow River many times a day. Mr. Zou showed us how a local invention of the watermill works as it brought water from the Yellow River to irrigate the nearby fields. At the provincial museum, he led us through the Silk Road Hall. Similar in style to a display at the Museum of American History back in New York City, this hall had panoramas of the peoples and their dwellings around the Silk Road times. Mr. Zou’s personal perspectives enriched our understanding of the city. He told us that provincial museums are some of his favorite museums because they are free, and they have high quality selections. After the Silk Road Hall, some parents went to an exhibit called the Red Gansu Province, which showcased how the Communist Party gained control of the Gansu Province, for which Lanzhou is the provincial capital. The others went to a hall named The History of Car Invention in the West. Mr. Zou told us that his father was from Shanghai, and his mother from Lanzhou. His origins are representative of the city population — a fast blend of Chinese folks from the north and the south converging here when Lanzhou was expanded as an oil refinery city after the establishment of the People’s Republic of China in 1949. Mr. Zou’s wife is the head of a preschool system. With this connection, we were able to visit one of the schools during the afternoon of our arrival where the children, teachers and staff graciously received us. We visited the classrooms, tasted dumplings the children just made, and were greeted in Chinese and English by these children. The children from our group also played with the children from the school. The Hexi Corridor with Qilian Mountain in the background. After Lanzhou, our next stop was Dunhuang. From Lanzhou to Dunhuang, the ancient travelers of the Silk Road had only one long narrow path they could use — the Hexi Corridor (河西走廊). To its south is the Qilian mountain (祁连山) and to its north is the largest patches of deserts in China. The corridor was the throat of the ancient Silk Road. Yes, it will be a long day, but we will be thousands of times faster than Xuanzang. Our learning today occurs on the train. The most important thing is to get a sense of how the landscape is like, and why travelers had to go through it. This requires us looking out of the train windows. Shiyu led a project of drawing the scenes along the way. We also asked members to write down the names of the train stations we passed, such as: Wuwei (武威), Zhangye (张掖), Jiuquan (酒泉) and Jiayuguan (嘉峪关). These are names that all Chinese folks know by the time they are high school graduates. In this poem, the Xiongnu people claimed the Qilian Mountain to be there mother, because their livelihood depended on it. In order to forge a path to the West, the Han Chinese pushed the Xiongnu people back to the north, sometimes the Xiongnu pushed back. In readings of various original sources, whenever the Han Chinese was in control of the Hexi Corridor, travelers could pass it with no problem, leading to the convergence of civilizations on the ancient Silk Road. These little details about the Silk Road made me think of, for the first time in my life, about the power struggles there and the complicated consequences. Taking other people’s land; making a large nation for yourself; all these bring to mind how my 11th grade daughter has recently started to question the rights of the U.S. to take over the lands of the native Indians. According to her, the term “settler colonialism” describes the U.S. government to the best. A scientific genetics study published over a decade ago revealed that the genes of northern Han Chinese are closer to that of the races to the north and west of China than their fellow Han Chinese to the south of China. I have had people coming to me identifying me as a Mongolian or a Tibetan. We have a teacher whose ancestors were highly likely Sogdian, the most prominent group of merchants on the Silk Road who were from the far away (modern day) Samarkand, Uzbekistan. Our lives are intertwined by history. While we cannot whip the course of history into one that fits our perfect vision, to the very least, we should go, observe and think about it. Yangguan Pass located to the southwest of Dunhuang. Dunhuang was a major hub on the Silk Road. It took me quite some reading a thinking to figure out that ancient Dunhuang was equivalent to Shanghai and Beijing of nowadays China. People from all directions and all walks of life gathered here. Ancient travelers replenished their travel supplies, stocks and energy, applied or renewed their travel documents, and got them checked. On top of that, they prayed. In order to create the best possible settings to pray, they dug caves and painted their revered images and scenes. Their spiritual energy has left its permanent marks on the grottoes in the region, such as the famous Mogao Grottoes (莫高窟). 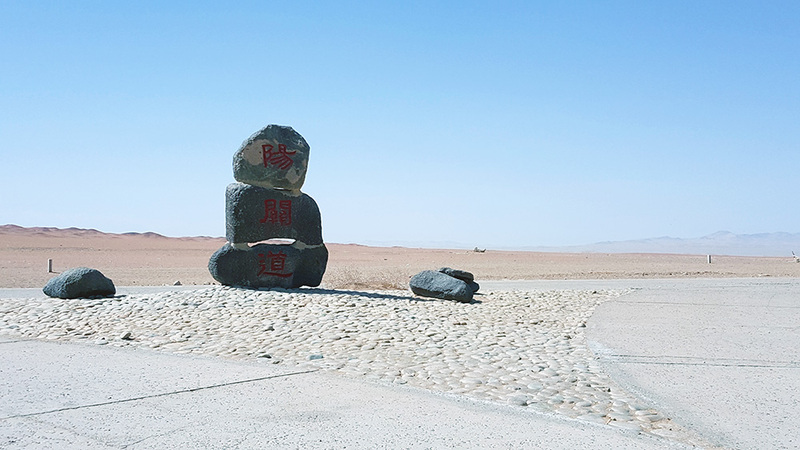 Dunhuang is a simple place if you just want to do sightseeing. It is a small city, with all the sights concentrated in an area. But if you want to trace history, with children, in a short amount of time, it can get complicated. I scouted Dunhuang and its surrounding areas rather thoroughly in early 2018. I read information and I talked to people. I visited many places with ancient maps and historical documents in hand. With the help of a very knowledgeable local guide, Li Qiang, I pieced together the story of Xuanzang in Dunhuang. We made a detailed plan as to how to effectively bring our members closer to Xuanzang’s experience. All in all, our group’s itinerary was able to hit the major sights in Dunhuang. On the first day we covered Mingsha Mountain, rode camels, did sand sliding, and rode on four-wheelers (they are like snowmobiles, but for sand). And we finished off with a visit to the Mogao Grottoes in the afternoon. Activities for the second day were slightly out of the ordinary. The plan for this activity was made during my scouting trip to Dunhuang. I asked Mr. Li that if he can arrange hikes for thousands of people in the desert that last for days, would he mind arranging something in a smaller scale for our families to hike in the desert for just a couple of hours. (Mr. Li’s company is a top-notch agency specializing in operating large-scale deserts hikes for groups sizing in the thousands, and each hike lasting for days.) He said yes, and we drew and revised our plans many times, wanting to make it doable but fun at the same time for all members of the group, young or old, fast or slow. The plan was to have a group-effort race. Members were divided into three teams and the goal was to race, on foot, from the starting point to the finish line (a desert stretch about 4 miles long). The first team to reach the finish line with all of its members would win. Along the way, a desert vehicle trailed the teams for security and to give rides to anyone who might drop out from the race. And finally, on the morning of the second day, our entire group was driven close to the Yangguan Pass (阳关). Teams were formed and everyone was ready for this hike-race! Once the race started, two children, each holding a flag for their own team, sped to the front as if they had been waiting to run like this their entire life. I started to chase them but were left to eat their dust as they disappeared beyond the horizon of the dunes. Having finally caught up with them on the security vehicle, I reminded them that while they left all the other teams behind, they also left behind their own team members, which disqualified them from winning even if they reached the finish line first. The other assistants understood the idea and the core message behind the no-team-member-left-behind rule. In particular, two of our teenage assistants, Martin and Zoe, stayed at the back of their group accompanying the last two members on their team. They found ways to motivate them to keep moving. On a different team, Shiyu would pull one member in each of her arms and help them move forward. The race concluded without incident and we all reached the finish line where Mr. Li and his team were waiting for us with the most welcoming slices of watermelon. We ate and spat out the seeds on the roadside, just like any worry-free person would do on a hot summer day in the middle of the desert. That night, at a family-style dinner with some members, I asked each to say a few words to reflect on their experiences of the hike. Le Le: I’m faster than I thought. But the fastest does not always win the race. Reece: Teamwork is really important. Teamwork is the dream work. Sabrina: It was hard for me. It must be hard for someone who does this everyday. Shiyu: My mom always taught me to grasp the most important thing to do. Today, I decided to focus on the members that were trailing behind so I can support and help them to get to the finish line. Zoe: I learned that Xuanzang must’ve been very tired. I admire him even more. Daren: I learned that the older members should protect the younger members. Also, I need to lose weight. Haiyun: I learned to set clear goals and focus all my energy on those goals. Jiyuan: Being number one is not always the most important goal. Moving along with a team is more important. You have to push yourself to do some things better. It was great to hear that everyone got something out of it beyond a great run. Our fleet of desert vehicles. It was long decided that the third day in Dunhuang should be a free-time day. Reasons? The schedules for the first two days were intense. There were so much to do and I was pretty sure our members might want to try some things again such as camel riding, revisiting the Mogao Grottoes or going to nearby towns. Besides, I think families would want a break from each other. I never thought of what I would do myself till the day before this free-time day. Having done the race in the desert stirred up a desire to go deeper into the desert. So, towards the afternoon on the second day, I made the decision and announced that I would hire a desert vehicle and a driver to go into the desert the next day. With no hesitation, Wen said she and Le Le would join me; then Pang-Mei and her daughter, Ming-Li. One after another, the size of the group snowballed. And just before the reply deadline of 8pm, Sabrina’s dad, Omar all the way in NYC, sent a message through WeChat: Not sure if already, but please include Sabrina. The next morning at 8:30am, twenty-three of us boarded 6 desert vehicles. Driven by Mr. Li’s very quiet but super competent local drivers, we went deep into the desert. Although much of the areas we went through were flat, we spent the day intimately embracing at least four landscapes: the Gobi desert, yardang, saline-alkali soil, and wetlands. On these lands, many lives have been lost in the course of history. Not assuming that these lands would be extra welcoming to us, we strictly abided by the rules Mr. Li and his team set for us, such as no behavior of directing or distracting the drivers was allowed. Another full day of adventures unfolded, experienced, wrapped up and savored. Even on this “free-time” day. For the ancient Chinese going westward, Dunhuang would be the last stop in their motherland. Once out of Dunhuang, travelers faced the awe-striking and life-threatening Taklamakan Desert. Those who chose to circle along this desert’s northern border would exit Dunhuang through the Yumen Pass (玉门关). Those who chose to circle along its southern border would exit Dunhuang through the Yangguan Pass (阳关). The great Tang Monk, Xuanzang, had to exit Dunhuang through another pass — the Suoyang Pass (锁阳关) — because he didn’t have the proper travel documents to pass Yuangguan and Yumenguan. From that point on, Xuanzang went through the hardest four days in his entire journey to the West. He lost his followers. He lost his horse. In dizziness he knocked over his drinking bottle and spilled the only remaining water he had. He hallucinated. He was near death. But, miraculously, he reached a place close to the modern day city of Hami (哈密). Then, the news of his arrival reached the nearby kingdom of Turpan (also known as Tulufan 吐鲁番) and the Turpan King, Ju Wentai, invited him over to teach Buddhism to the people of Turpan. In our itinerary, we chose to go directly from Dunhuang to Urumuqi, bypassing Turpan. This was to reduce the number of hotels we needed to stay in. After having settled down in Urumiqi, the next morning, we boarded a train to Turpan. The journey from Dunhuang to Turpan took Xuanzang four days; our groups completed in five hours on the modern high speed train. When Xuanzang arrived at Turpan, the kingdom was already a devout Buddhist nation. That was the reason why the Turpan King Ju Wentai asked Xuanzang to stay and teach his people, and to Xuanzang’s dismay, permanently. Xuanzang had to go through a four-day hunger strike to get the Turpan King to agree to let him leave the kingdom. To get the permission to continue his journey westward, Xuanzang had to promise two things to the Turpan King: Xuanzang would teach the people of Turpan for another two months; on his return trip after his study in the West (modern day India), he would stop by Turpan again to teach its people the newly found knowledge he got from India. Upon Xuanzang’s departure, the Turpan King wrote Xuanzang twenty-seven personalized letters, each addressing to the leaders of a kingdom Xuanzang would pass on his journey. Along with the letters, the Turpan King also gave him sufficient money, supplies and even servants so that Xuanzang was then able to travel with much ease and devote his energy to his studies rather than basic survival. Our group traveled through the ruins of the ancient kingdom of Turpan, which is very well preserved by the dry climate of the desert. We identified the possible spot where the Turpan King, along with his Queen, received Xuanzang deep at night, holding candles in their hands, and the spot where Xuanzang gave lectures to the Turpan people. At the ruins, the driver of our trolley was a Uyghur. He grew up with these ruins. While looking at the empty ruins, I said how lucky we were there on a day when there were practically no other tourists around. Later on, when I viewed some pictures I casually shot of our group members, young and old, children and adults, were all immersed in their own moment seeking the footsteps of Xuanzang, and for the past. The ancient ruins at Turpan. While waiting to board the train to Turpan from Urumuqi, the children from our group started to draft another play — the story of Xuanzang and Jun Wentai the Turpan King. On our train ride back to Urumuqi, they practiced in the corridors of the train cars, and upon arrival at our hotel, inside the gigantic dinning room, they performed their play for our teachers and parents. May your journey also be filled with courage and determination!